Filson began 118 years ago in Seattle and the brand never intended to appeal to anyone but hunters, fishers and outdoorsmen. But sometimes you can’t control who’s into you, you know? Now that it’s cool for urban and suburban men to dress like they’re chopping logs in the woods, it’s boom time for Filson. And the brand’s expansive, newly remodeled showroom and manufacturing facility just south of downtown Seattle speak to that prosperity. Photographer Matthew Sumi snapped the action at the grand re-opening party for the Filson facilities. And Filson’s creative director Alex Carleton spoke to us about talk about stewarding the brand, favorite hikes and the importance of being earnest. See images below interspersed with the interview. The Teva renaissance is upon us and the good news is you don’t have to be all River Wild about it. Not that there’s anything wrong with a more granola look. But consider Tevas as streetwear and options open up. Check out these guys from the 1995 Nordstrom Anniversary Sale catalog, especially the guy on the left in his deep teal fleece. Looks pretty cool, right? People hate on fleece but they’re tripping. It’s not all the same. You can’t just write off all fleeces. That’s material-ist! Peruse our collection of fleeces and be real with yourself. Legit freshness abounds. 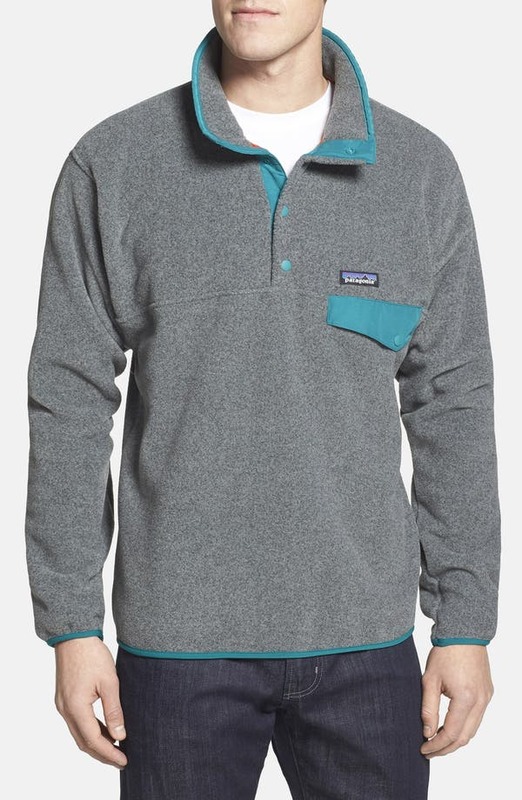 Like, for example, this slammin’ Patagonia pullover. Almost every image from the 1981 Nordstrom spring catalog is straight flames, and this one is no exception. Here we see two beach dudes dressed excellently for a season that can’t make up its mind about the weather. Is it hot out? Is it chilly? Don’t freak out, though, bro. Handle both weathers at once! Introducing the waviest streetwear/outdoor gear we’ve ever seen: the new capsule collaboration between Barbour and White Mountaineering. We’re biased because we sell it, but believe us when we tell you we love this stuff. That anorak with those Timberlands? Too clean! The image above shows a Complete Look made by our stylists at Studio N. And if you thought that jacket might also look good with Stan Smiths, another of our Complete Looks confirms you are correct. For the inside scoop on the English/Japanese team-up, we reached out to Barbour’s head of menswear, Ian Bergin, and White Mountaineering creative director Yosuke Aizawa. We based our latest Pop-In Shop—LET’S GO!—on the idea of an epic road trip through the US of A. But that doesn’t mean the gear housed therein isn’t tough enough to go international. Keep reading for a selection of photos from our Creative Director, Strath Shepard, on a recent road trip across British Columbia to the Canadian Rockies. Fresh air. A campfire. Beers cooled in a creek. We can write these things down all day, but it’s impossible to understand the sheer satisfaction that such simple, outdoor pleasures can engender without experiencing them first-hand—and, preferably, with frequency. Portland brand Poler operates on a simple mission (which desk jockeys like us can appreciate): to get average people outdoors—and out of their everyday routine—more often. They sum it up with a deceptively simple catch phrase/hashtag: #CampVibes, two syllables that manage to instantly evoke dirt underfoot, cedar in your nostrils and a canopy of stars overhead. And they make it effortless, with innovative gear like a sleeping bag you can walk around in, a camera bag that doubles as a cooler, and a Stumptown coffee kit designed for the campsite. Keep reading for our exclusive Q&A with Poler Co-Founder and Creative Director Benji Wagner, in which he discusses couscous, favorite road trip spots, and thinking like a kid.